Good morning! Today I have some photos from the displays at leadership. All these photos are from the Wall of Wonder. Stampin' Up! asked their staff to create projects for the Wall of Wonder and these are just a few of what was on display. This first one was created using out Trinket Crowns, Keys and Simply Adorned Baubles. Wouldn't that make a gorgeous piece of art for your home?! This one uses the Springtime Vintage dsp and our Vanilla Rosettes - AMAZING! This one uses the Botanica Gazette dsp - look at all those layers! This one is one of my favorites. If you look closely, they used Springtime Vintage dsp for her had and then the addition of the Simply Adorned bauble for the earing and then as a necklace. Simple but sooo elegant. I would love that in my home. This one is just a combination of punches and dies but I thought it would make a cute background for a scrapbook page. Here's one using the fabulous Petal Cone and Fun Flowers dies. Can you tell what was used for this one? Our Pompom Trim - isn't it cute?! 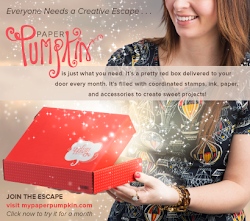 Hopefully these have inspired you to think outside the box and use your stamping & scrapbooking supplies in new ways.